Provide a safe and cosy den. This could be a bed in a quiet, enclosed corner, or a crate with comfy bedding he has learned to see as his own. If you are only going out for a couple of hours, leave him in his crate (with water) so he can view the time as his rest period. Try leaving the TV or radio on, so it sounds as though someone's in the house. Your dog is likely to become anxious if he runs out of essentials, such as water. Leave a large, fresh bowlful before you go. Dogs feel secure when they know what will happen next, so stick to a routine he enjoys. If your dog likes cuddles he might appreciate a fleecy blanket or soft toy to cozy up to while you're out. Teach puppies to be alone. From even just a few weeks old they should be moved away from their littermates for short periods so they learn to cope with isolation. 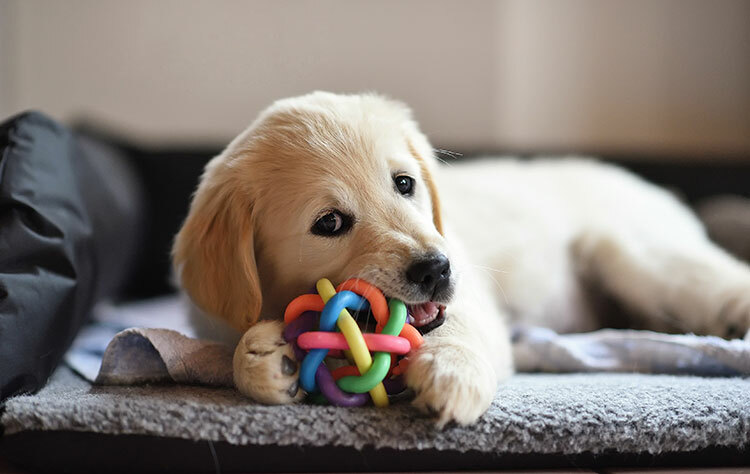 Activity toys can keep your dog busy while you're out (see products panel). These come in various shapes and sizes but the general principle is that you stuff them with food treats; the dog then has to work to get these out, either by rolling the toy around the floor or licking or chewing at the inside. Alternatively, organize a game of hide-and-seek by stashing treats in nooks and crannies around the house. Your dog can hunt for them while you're out. Keep all your arrivals and departures low-key and ignore any excitable behaviour from your dog at these times. If you make a fuss of him before leaving, or when you return, it will make the contrast of your absence more unbearable. If your dog jumps up and is excitable when you come in, try greeting other members of the family and making a cuppa before saying hello to him. Similarly, don't try to make up for your absence by making a huge fuss of your dog when you are at home, as this will also lead him to rely on you more heavily. Make sure he has periods of isolation even when you are in the house and don't always give in to his demands for attention. Just because you have to go out, doesn't mean your dog needs to be alone. Is there a dog-friendly neighbour who could let him into the garden or take him for a walk? Or a dog-mad, but responsible, teenager who might want to come to play? Maybe you have a friend or relative who would be happy to have your dog for the day? Younger and older dogs in particular will need to be let out to toilet, as they may not be able to hold on for more than a few hours. Ask for recommendations for pet-sitters if you are really stuck - your veterinary surgery is a good place to try. Make sure your dog's had plenty of exercise and stimulation before leaving him. Ensure he has a plentiful supply of clean, fresh water. Consider getting expert help if your dog is very unhappy or destructive when you're out. Never leave him for excessively long periods. Allow him constant access to you at home. Punish your dog if he's made a mess while you're away. Make too much fuss when you leave or return home.